[one_half last="no" spacing="yes" center_content="no" hide_on_mobile="no" background_color="" background_image="" background_repeat="no-repeat" background_position="left top" border_size="0px" border_color="" border_style="solid" padding="" margin_top="" margin_bottom="" animation_type="" animation_direction="" animation_speed="0.1" class="" id=""][fusion_text] [/fusion_text][/one_half][one_fourth last="no" spacing="yes" center_content="no" hide_on_mobile="no" background_color="" background_image="" background_repeat="no-repeat" background_position="left top" border_size="0px" border_color="" border_style="" padding="" margin_top="" margin_bottom="" animation_type="" animation_direction="" animation_speed="0.1" class="" id=""][/one_fourth][one_fourth last="yes" spacing="yes" center_content="no" hide_on_mobile="no" background_color="" background_image="" background_repeat="no-repeat" background_position="left top" border_size="0px" border_color="" border_style="" padding="" margin_top="" margin_bottom="" animation_type="" animation_direction="" animation_speed="0.1" class="" id=""][/one_fourth][fusion_text]This week Office Mechanics gave a demo for the upcoming Skype for Business which has been in preview since the Office 2016 preview became available. Initially I was just excited for the rebranding simply because I knew it would bring a tighter integration between Lync and Skype, mainly video chatting between streams. Aside from that, I selfishly despised the fact that there were two accounts needed in the enterprise, one for your Office 365 account and Lync, then a second tied to an MS ID in order to use Skype. Having Lync rebranded to Skype for business eliminates both of those. Secondly in my dealings with multiple PBX vendors over the year I always wanted to see an easier connection between Lync and the PBX. All though there were PBX vendors that allowed integration, either natively or with third party hardware, the configuration always seemed to provide some complexity that was difficult to feel secure with. Additionally there always seemed to be some sort of trade off with functionality on either side. From what has been gathered or mentioned so far, this should resolve many of those issues. So it appears the dream has come true. It's been hard to find out more information regarding the where, when who or what, however it is called Office 365 Skype for Business with PTSN. It's my understanding that those with an E-4 license will be able to use this service. That being said, not sure who the providers are going to be for the SIP Trunking. My Instinct is it's going to be those that are part of the Azure Express route. In business, many feel uncertain with moving resources and data to the cloud. The primary questions always become the security, and data control. 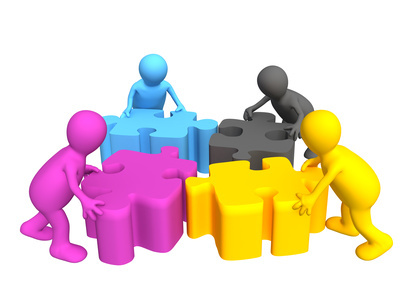 Albeit they are valuable concerns they should be redirected to the type of data and the partnered provider. The suggestion is based off the fact that not all providers are equal, for instance think of trusting an enterprise like Microsoft vs. a local small business IT firm. Both have pros and cons but there is something to be said not only reguarding the scale of the environment, knowledge of the engineers but the inverse, having the ability to hold someone accountable. Potentially switching to cloud based services can also change the dynamic of the IT staff within the business. Just because services have transitioned to the cloud doesn't eliminate the need for internal IT Staff. In my opinion what it does is drastically change that dynamic, for instance putting e-mail in Exchange Online can eliminate or reduce the need for an Exchange Server Administrator in a fully hosted solution. That doesn't mean that all your internal Exchange knowledge isn't needed but it's changed. It turns more from a systems or infrastructure management role to an Exchange management role. There are still tasks that need to be performed, such as user creation and support, but the focus becomes more management. Think of it more as a management role in the sense that now it's about setting corporate policy on retention, mailbox size, and other business driven requirements. Essentially, and even though its still technical,the theory and principal knowledge is still required from your staff. Overall these are some of the things that the business and IT Management need to consider. Does it make sense for the business, how does the change affect staffing, is the internal knowledge there to support the change. As an IT Professional it's something we need to consider as well, how do we continue to adapt? I like to think there are two types of IT professionals, those who are the jack of all trades, vs those that are product specific. Having said that both need to adapt and start to become a bit broader in breath. For instance, the Exchange Administrator referenced above could easily transition into a "Communications Management" type roll. Meaning instead of working on the nuts and bolts of Exchange they could understand how to manage Internet cloud based communications and options such as "Exchange Online, Skype for Business". They could transition into managing those rolls for the company and leveraging the cloud to make those possible. At the end of the day, as an IT Professional our industry is changing and depending on your industry you need to evolve as well. If you aren't working for a cloud provider of services, it would be beneficial to broaden your horizons and learning about the cloud. There are times where messages become stuck in an Exchange Messaging Queue on a Transport Server. This article describes on how to get the Queue Name and then how to remove those messages in that queue. IN the above example we are using the Remove-Message cmdlet and specifying the HUB Transport Server. If you have multiple stuck messages in a Highly Available configuration you would need to alter the <EXCH TRANSPORT SERVER> for each server in the array. This cmdlet returns all the queues on a specific HUB TRANSPORT server. This is important incase you have a bad queue in which you may want to manually delete e-mail messages. You can run the same command above with the IDENTITY parameter from Get-Queue command. Office 365 - Hybrid Wizard Fails Due To " 407 Proxy Authentication"
ERROR : System.Management.Automation.RemoteException: Federation information could not be received from the external organization. Exchange was unable to communicate with the autodiscover endpoint for your Office 365 tenant. This is typically an outbound http access configuration issue. If you are using a proxy server for outbound communication, verify that Exchange is configured to use it via the "Get-ExchangeServer –InternetWebProxy" cmdlet. 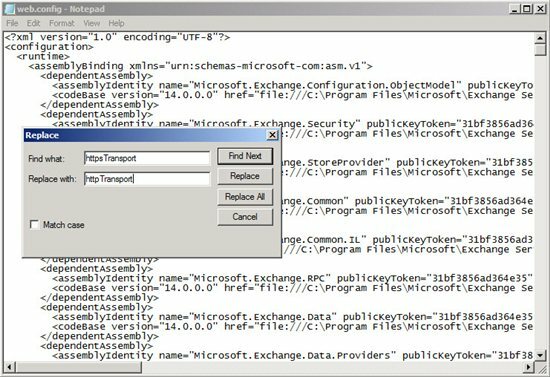 Use the "Set-ExchangeServer –InternetWebProxy" cmdlet to configure if needed. Using your own profile, disable your "Automatically detect settings" and then export the registry key from HKCU. Use a utility like “PsExec” to launch Internet Explorer as “Local System”, disable the setting and save the changes. psexec.exe -i -s -d "C:\Program Files\Internet Explorer\iexplore.exe"
Happen to be in the Exchange Control Panel and noticed that on our DAG it was listed as "Failed and Suspended" for the status of one of the members. I was perplexed that we didn't catch this from our monitoring or any where else, but that's a whole other issue. My concern here was it was obviously failed. Attempting an Update or Resume resulted in no feedback in the ECP and no change in Status. It was here, that as I mentioned above, that the status wasn't changed upon attempting to update or resume the database copy. I attempted an Update-MailboxDatabaseCopy as one would assume would reseed the database, I even added the -DeleteExistingFiles switch specifically to start from scratch, yet recieved "The seeding operation failed... ...which may be due to a disk failure"
That proceeded as expected. However as the message states I went to clear the items (specifically the logs) manually and strangely received an error message "Remove-Item: The file or directory is corrupted and unreadable"
At this point, I was surprised and decided that there actually had to be a disk issue. I browsed manually back to the location and attempted to delete a log file manually and received the same popup within Windows. I was amazed, I actually had a disk problem. This was only strange to me because our underlying disk is actually an NetApp LUN. That LUN actually holds all three DB Copies from each of the three servers in this instance. So for one disk to be corrupted and not all three (First off Thank God!) I was miffed. At this point I went ahead and formatted both the Drive that contained the EDB, and the LOG files. After confirming that the DB Copy Status didn't show the original copy still I went ahead and ran the Add-MailboxDatabaseCopy command to reseed form scratch a copy of the DB. Wella, it worked and began copying over. Next disable the requirement for SSL on the OWA virtual directory. 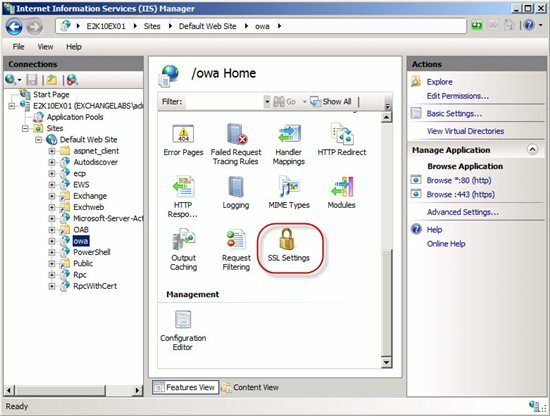 To do so, open the IIS Manager and expand theDefault Web Site. Under the Default Web Site, select the “owa” virtual directory. Under features view, double-click on “SSL Settings”. in order for the changes to be applied. 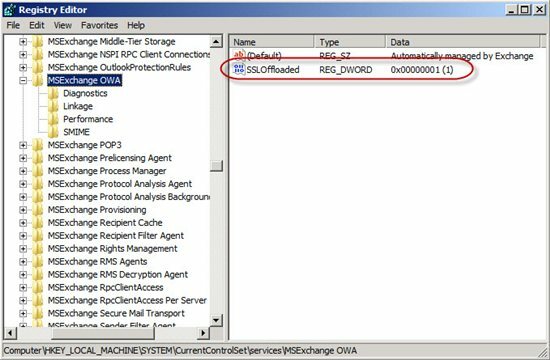 Unlike OWA, configuring SSL offloading for the Exchange Control Panel (ECP) doesn’t require a registry key to be set. Well, to be more specific ECP will use the same registry key as the one we set for OWA. So in order to enable SSL offloading for ECP, the only thing we need to do is to disable the SSL requirement on the ECP virtual directory. To do so, let’s open the IIS Manager and expand the Default Web Site. Under the Default Web Site, select the “ecp” virtual directory. Under features view, double-click on “SSL Settings”. So in order to enable SSL offloading for ECP, the only thing we need to do is to disable the SSL requirement on the ECP virtual directory. To do so, let’s open the IIS Manager and expand the Default Web Site. Under the Default Web Site, select the “ecp” virtual directory. Under features view, double-click on “”. ” in the Actions pane. ” so that the changes are applied. To enable SSL offloading for Outlook Anywhere only requires one step which depending on whether Outlook Anywhere already is enabled or not can be done via the Exchange Management Console (EMC) or the Exchange Management Shell (EMS). ” in the context menu. Running the above command will disable the requirement for SSL for the RPC virtual directory in IIS, which means we don’t need to do so manually like it’s the case with the other services/protocols. To enable SSL offloading for the Offline Address Book (OAB) you just need to remove the SSL requirement on the OAB virtual directory. To do so, let’s open the IIS Manager and expand the Default Web Site. Under the Default Web Site select the “OAB” virtual directory. Under features view, double-click on “SSL Settings”. Require SSL” and click “Apply” in the Actions pane. Finally, open a command prompt windows and run “iisreset /noforce” so that the changes are applied. Some of you may probably recall you have read on Microsoft TechNet and various other places, that it isn't supported . This used to be true but is now fully supported (although the Exchange documentation on Microsoft TechNet hasn’t been updated to reflect this yet). SSL offloading for Exchange ActiveSync is only supported at the Internet ingress point. It’s still not supported in CAS-CAS proxy scenarios between Active Directory sites. Configuring Exchange ActiveSync to support SSL offload is very simple. 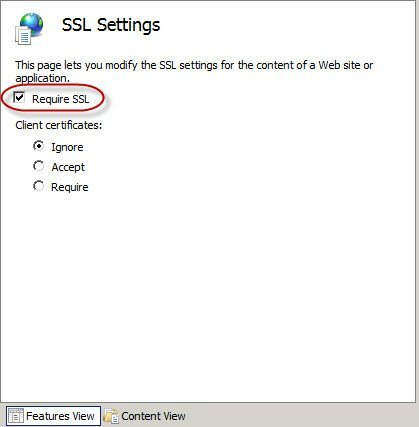 You only need to remove the requirement for SSL in IIS. To do so, let’s open the IIS Manager and expand the Default Web Site. Under the Default Web Site select the “Microsoft-Server-ActiveSync” virtual directory. Under features view, double-click on “SSL Settings”. Now uncheck ”Require SSL” and click “Apply” in the Actions pane. With Exchange 2010 SP1 and SP2, you will no longer need to modify the web.config file. Performing the process below with the new SP1 or SP2 files will cause EWS to fail activation. 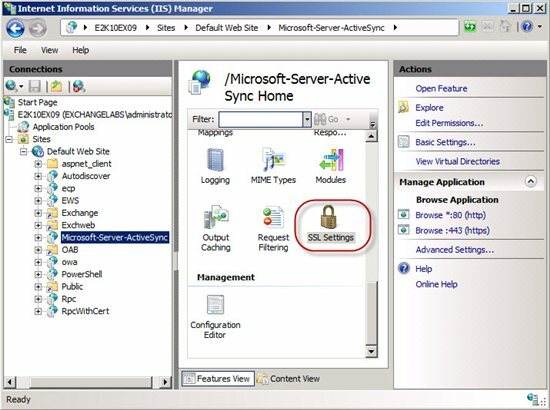 To offload SSL for EWS, you only need to remove the SSL requirement from the IIS virtual directory as described in the steps above. 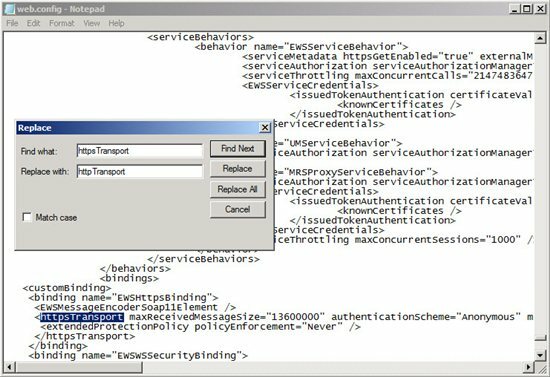 To configure SSL offloading for Exchange Web services in Exchange 2010 RTM, you must perform two modifications. The first one is to remove the SSL requirement for the EWS virtual directory in IIS. To do so, let’s open the IIS Manager and expand the Default Web Site. Under the Default Web Site select the “EWS” virtual directory. Under features view, double-click on “SSL Settings”. Next step is to make a change to the configuration file (web.config) for the EWS virtual directory. This file can be found under C:\Program Files\Microsoft\Exchange Server\V14\ClientAccess\exchweb\ews and be modified using a text editor such as Notepad. It's recommended you take a backup of the web.config file before you perform the next step. ” and then save the file. 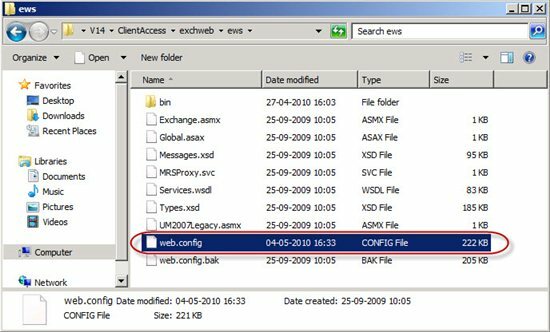 With Exchange 2010 SP1, you will no longer need to modify the web.config file. To offload SSL for EWS, you only need to remove the SSL requirement from the IIS virtual directory. 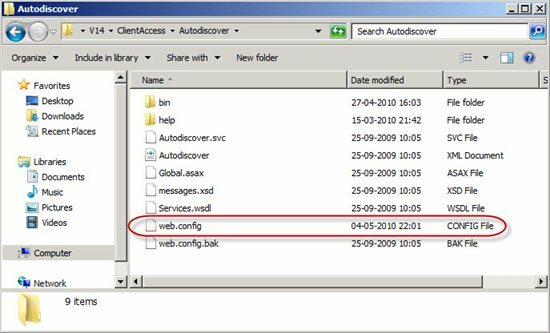 To enable SSL offloading for the Autodiscover service, you must perform the same steps as those applied to the Exchange Web service virtual directory. With Exchange 2010 SP1 and SP2, you will no longer need to modify the web.config file. Performing the process below with the new SP1 or SP2 files will cause Autodiscover to fail activation. 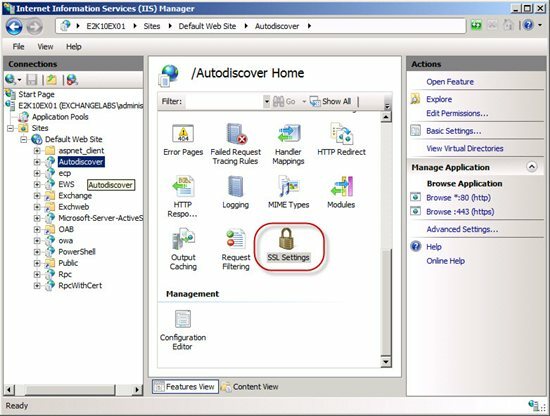 To offload SSL for Autodiscover, you only need to remove the SSL requirement from the IIS virtual directory as described in the steps above. and be modified using a text editor such as Notepad. Finally open a command prompt windows and run “iisreset /noforce” so that the changes are applied. Shoretel - Workgroup stuck in "Off-Hours"
In Shoretel you can set a schedule for a work group to set your "On-Hours" and "Off-Hours" to have different call handling modes. In this case we have the "Off-Hours" set to ring a night bell that can be picked up from any phone. The situation today is that all calls during the "On-Hours" were ringing that Night Bell instead of the workgroup. What we were able to see; On any company extension, when you dial the number for the workgroup you immediately saw it forward to the "Night Bell". Our immediate thought was that the Operators were not logged in, thus forcing it into Off-Hours. That wasn't the case. At this point, we confirmed the Time\Date on the server to make sure it matched the schedule for the workgroup, it did. At this point we were pretty much at a loss, everything looked to be operating normally. Finally we found it... The "Current Call Handling Mode" was stuck in "Off-Hours". Why we overlooked this box to begin with, not sure but we missed it. At this point we tried to change the schedule to another one of our schedules. That did not do the trick. We tried taking off the schedule completely, no joy. Attempted to also alter the time on the server to put it into "Off Hours" then back to "On-Hours". That didn't work either. What did work was editing the hours for the date. For instance, if it was Tuesday we edited the original schedule to remove any configuration. Upon saving we referred it back to how it was prior and we were good to go. The Call Handling mode returned to On-Hours. For a remote site that runs behind a firewall that does not support DHCP options, you might have to manually configure an SNTP server. 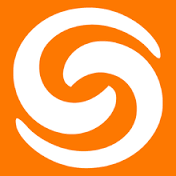 Learned a new trick today regarding Shoretel. We are prepping to deploy Lync Online out to the company, however Lync and the Shoretel Communicator don't play nice depending on the version. Combine that with Shoretel only prompting once for a client side update when you go between backend versions we could almost guarantee there would be major issues if just pushed out Lync. However found a little trick in the Shoreware director. If you go to "System Parameters" "Other", there is a section that allows you to have a Minimum Allowed Client and a Minimum Required client. If you updated those to be the current or version needed it will immediately prompt and require a client side upgrade on the clients. Remove the First 3 lines. The first line is whitespace, the second says Full Name, the third is ----. Run the following command with the persons user id. .\BulkSet-NTFSPermissions.ps1 -FolderListFile c:\temp\FolderPermissions.txt -SecIdentity "Domain\Group or User" -AccessRights "FullControl" -AccessControlType "Allow"
.\BulkSet-NTFSPermissions.ps1 -FolderListFile x:\xxxx\xxxx.txt -SecIdentity "Domain\Group or User" -AccessRights "FullControl" -AccessControlType "Allow"
FolderListFile: a flat text file containing the list of path that need to apply the NTFS permission. It needs to list one folder per line. the path can be a absolute local path such as C:\temp or a UNC path such as \\computer\C$\temp. SecIdentity: The security identity (such as a user account or a security group) the permission is applied for. 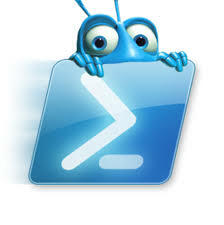 AccessRights: type of access rights, such as FullControl, Read, ReadAndExecute, Modify, etc..
Exchange 2013 Migration via Powershell script based upon search. During a migration from 2010 to 2013 we were working on changing some of our e-mail retention policies. We had implemented journaling through a Barracuda Message Archiver to retain our messages per company policy. Second to that, we also wanted to migrate our e-mail storage from our existing mentality of just letting people manage an unlimited "pot" of e-mail. This isn't very cost effective for one, second to that it doesn't make for an Exchange Environment that is easy to manage and project future costs. Because of this we were going to finally put into place e-mail box quotas to force people to clean up their mailbox. We already had retention policies in place, however our average mailbox size was still well over 2GB. That being the case we decided to set a max size of 2GB in order to allow for the future projection of growth, and keep a relatively static cost regarding our high end storage that is hosting our DAG. The first issue we ran into (Other then how to deal with lowering those over 2GB) was how to migrate forward while at the same point dealing with those boxes that were larger. Even though we could look into exchange and get a list of all the mailboxes that are currently below the 2GB quota, to have to parse through the Migration Job Wizard and manually select all those users would be tedious. So... a script is in order to handle this for us. Well even as great as Exchange is, it doesn't make it easy to accomplish this. The "TotalItemSize" property that contains the full mailbox size is stored within the Get-MailboxStatistics CMDlet. However the New-Migration, or New-MigrationBatch CMDlets require an e-mail address in order to process a migration, and that is NOT stored in the Get-MailboxStatistics CMDlet. There are several "commonalities" between the various CMDlets, such as GUID, Display Name and so forth, however we decided to use DisplayName from Get-Mailbox. Essentially what we did was run Get-MailboxStatistics with a filter based upon the TotalItemSize being less then 1.5GB and not already existing in the new databases. We then ran the Get-Mailbox Command to return all mailbox DisplayNames, and compared the two files in order to build a text file that could then be ran to return all of the "PrimarySMTPAddress" from the Get-Mailbox command to have the correct information needed to do the migration batch file. Below is a snippet of that code. You will also notice that there was some triming and parsing of the file in order to translate from the output of the Get-MailboxStatistics to the format needed to run the loop to pull the e-mail addresses. Write-Host -foregroundcolor Yellow "Running the compare to gather the list of users who will be part of this migration"
Write-Host -foregroundcolor Yellow "Trimming and parsing file"
Write-Host -foregroundcolor Yellow "Final Pruning"
Below is the rest of the script (Also Attached). The first portion of it makes sure that the location of the temp files is clean on the off chance it wasn't prior. The last portion not only starts the exchange migration, but also cleans up after itself. Write-Host -foregroundcolor Gray "Compare.txt didn't exist"
Write-Host -foregroundcolor Gray "PrimarySMTP.txt didn't exist"
Write-Host -foregroundcolor Gray "MigrationEmails.txt didn't exist"
$Subject = "Your E-Mail Box is Migrating"
Write-Host -foregroundcolor Yellow "Reformating Migration file"
Write-Host -foregroundcolor Yellow "Adding Migration to Exchange 2013"
Write-Host -foregroundcolor Yellow "Migration Batch of $MigrationName has started"
Write-Host -foregroundcolor Yellow "$MigrationName did NOT START"
Write-Host -foregroundcolor Yellow "Cleaning Up Files"
Write-Host "Starting sleep to allow upload." #Write-Host -foregroundcolor Yellow "$CompareFile , $PrimarySMTP , and $MigrationEmails were removed"
There may be a time when you need to list all the users of a specific OU, not just the entire domain. An example, is if your Organizational Units were broken down in departments and you wanted to compare that department to an active employee roster for instance. Other times, you may seperate your OU's into one that contains your company accounts vs. service accounts. For this case, you can use the Get-ADuser commandlet in order to do so. Below is a screenshot of the default properties shown, and a second showing the extended properties. This command will search the OU Company in the Domain Example.com, It will also select just the Surname, and Given Name sorting by the Surname.